A fabulous GROUND FLOOR city centre apartment. Situated perfectly for access to all the major City attractions and many can be reached on foot. The Playhouse and Omi Centre is a short 10-15 minutes walk and a further 5 minutes walk would take you to Princes Street where you can enjoy Princes Street Gardens, the Scott Monument, Designer shopping at Harvey Nichols and world famous Jenners of Edinburgh and Waverly Train Station. There is an array of cafes and restaurants only a short stroll from the apartment and makes eating out an attractive option. Edinburgh Castle, the Royal Mile, The Palace of Holyroodhouse, the Scottish Parliament Building are all within easy reach and although can be reached on foot, there is a great bus service just a short 1 -2 minute walk from the apartment. After enjoying the sights and sounds of historic bustling Edinburgh, retreat back to your modern holiday home. There is a private balcony where you can enjoy relaxing in the evening or indeed have breakfast on before setting out for the day. The apartment has FREE residents street parking around the apartment and also secure underground parking accessed by the use of a security fob. There is also FREE access to the gym based within Allanfield Place that contains all the usual equipment of running machines, bikes and weights. The apartment has 1 Bedroom that includes 1 comfortable double bed, wardrobe, 2 bedside cabinets, chest of drawers and hair dryer. The modern open plan Living Room/Dining Room/Kitchen includes a 40" Smart TV/DVD player with FREE WiFi and Freeview, table and chairs, fully equipped kitchen including microwave, fan assisted oven, electric hob, Large Fridge/Freezer and Washer/Dryer - Ideal for a longer stay. Crockery, cutlery, pots and pans, backing trays, kettle, toaster are all included and Egyptian Cotton towels are supplied. There is a welcome pack that contains Tea, Coffee, Milk and Snacks. Also washing powder, washing up liquid, cling film, tinfoil and other bits and bobs are included to make your stay as fabulous as possible! Check in is convenient and flexible, using the secure key box located at the apartment or alternatively we can provide a meet and greet service to handover keys and show you around the apartment. Check in is from anytime after 13:00. If your check in time is after 18:00 and you require a meet and greet at the apartment, please send an enquiry before booking to ensure we can facilitate this. Note: The apartment is set in a lovely quiet spot in Edinburgh and is ideal for couples (2 guests only) and therefore strictly no parties or smoking. 15% DISCOUNT off car hire from Arnold Clark when you book our apartment. Arnold Clark locations include Edinburgh Airport, Edinburgh Sighthill and Edinburgh Seafield. Note: discount off base rental price and excludes extras. Discount code will be provided when apartment booking is confirmed. The bathroom has a bath with an electric Mira shower, toilet, and sink. There are shelves and a storage unit to store your bits and bobs and a large heated towel rail. Egyptian Cotton Towels are supplied including bath mat and face cloths. Best sheets, pillow cases, pillows and duvet. FREE access to Gym within Apartment Complex. Large Fridge/Freezer, Electric Hob, Fan Assisted Oven, Kettle, Toaster and Microwave Oven. Good size round table and chairs, ideal for eating a lovely meal. A great selection of Edinburgh Travel books and guides. Relax on the balcony that includes a bistro set of table and 2 chairs. I had a short weekend stay in Edinburgh on March 8th to 10th. This apartment was approximately a 20 minute walk from the train station in the downtown area. The apartment was clean and had all the amenities required. 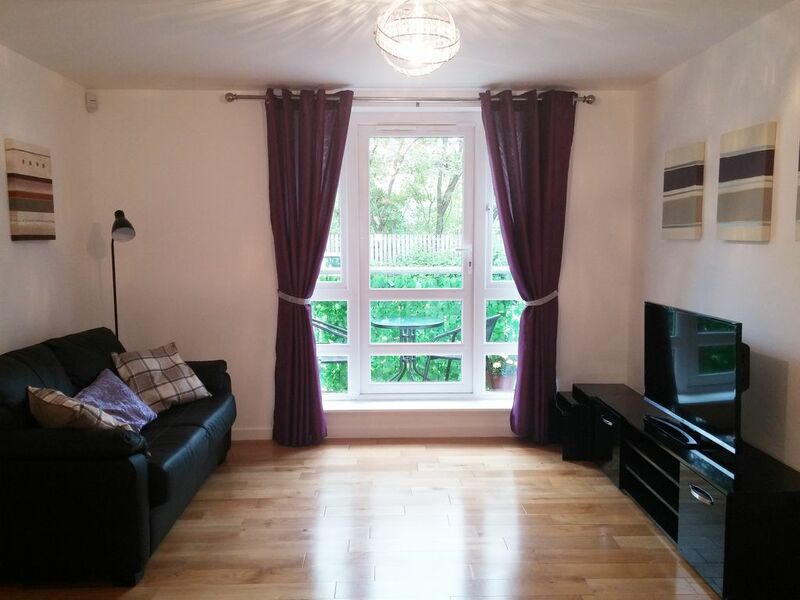 Very nice flat in a great location. A great place for two to stay in lovely Edinburgh! Would not mind staying there again! A great place for two to stay in lovely Edinburgh. ! Lovely apartment would definitely recommend it. We had a lovely couple of days in Edinburgh partly due to the accommodation being so convenient for everything and the apartment had everything we needed very clean and comfortable would stay again thanks Susan and Mark.